If you’re going to endure all the pain of getting a tattoo, you probably want to ensure that whatever’s being permanently etched on your body is unique and original. So instead of a heart with a dagger through it, why not get a series of animated figures that turn you into a living zoetrope? First, a quick refresher: If you’ve ever visited a science center, you’ve probably experienced a zoetrope—it’s one of the antique spinning contraptions that animates a series of still doodles on the inside as you peer through the side. This artist from animation studio Open the Portal essentially created the same thing on his body with a sequence of animated stills tattooed all the way around his torso. 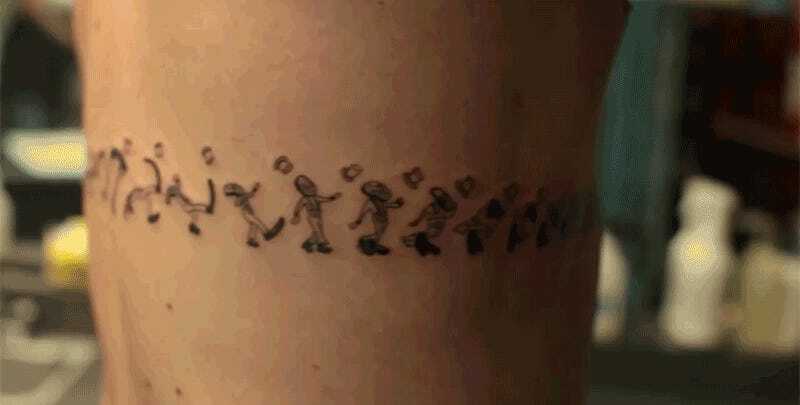 It helps to have a video camera or a strobe light to visualize the animated results as he spins around, but as tattoos go, it’s an incredibly original idea (if a little obsessive). It’s just too bad he’s going to have to constantly keep taking his shirt off to show it to people.